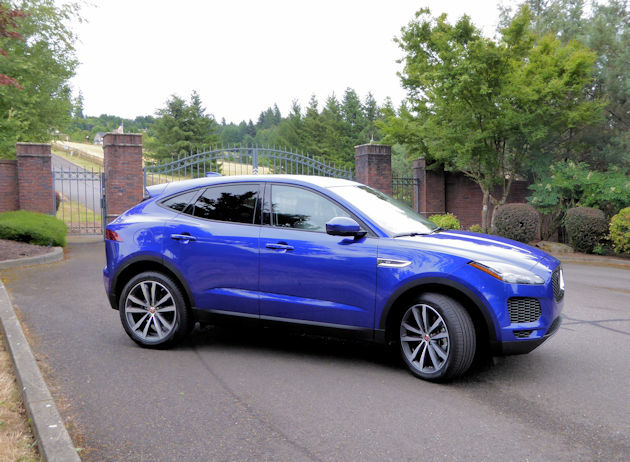 When Jaguar went into the SUV business three years ago, they did it with great flare producing one of the most stylish SUVs on the market. It also didn?t hurt that the F-Pace drive elements were a collaboration with sister company Land Rover. The partnership gave the Jaguar ?Pace? SUVs impressive off-road dynamics, but like most people we?d be hesitant to take such a pretty face very far off road. 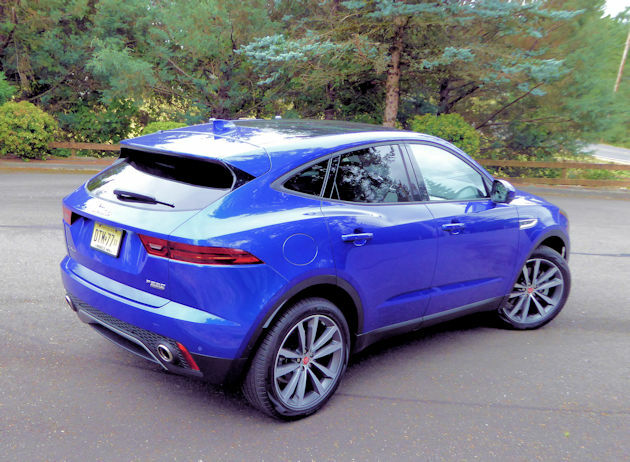 With the proliferation of SUVs in the market, Jaguar planners also knew they needed to have variations with their SUV theme and that meant a smaller version, so they added a compact version called the E-Pace. (We would have thought they would save that name for an electric version, but the new electric version is called the I-Pace. We?ll review that in a few weeks.) 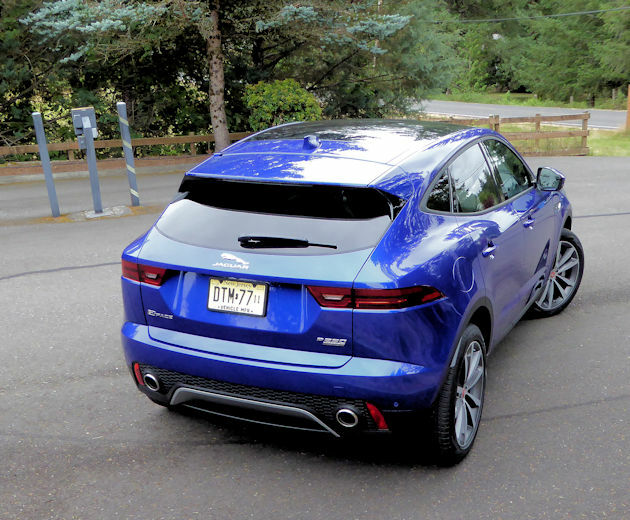 The E-Pace is about 13 inches shorter in length and 4 inches narrower than the F-Pace. 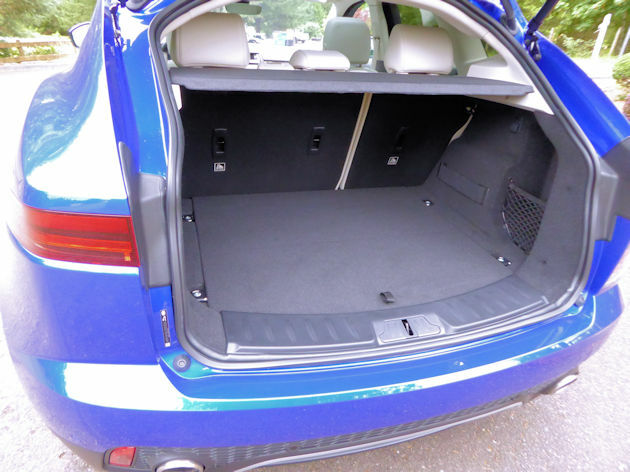 It has room for five adults and 24 cubic feet of luggage, or with the full 40/60 split rear seat backs folded, it holds up to 51.6 cubic feet. The cargo liftgate is available with a handy foot-activated gesture control. 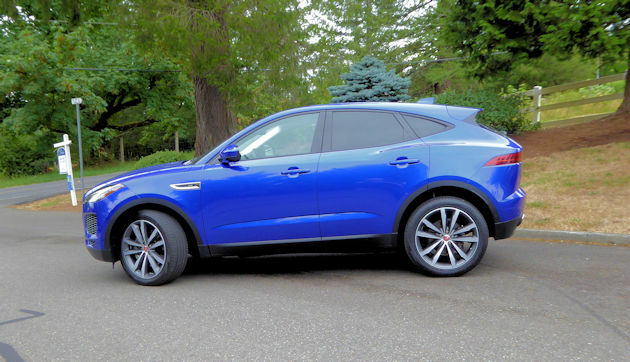 There is no confusing the Jaguar family grille, fast sweeping roof line and muscular lines with other compact SUVs ?this one has a strong Jaguar sports car DNA. The surfaces are clean and strong-looking with LED headlights integrated smoothly into the upper corners of the front end. Well bolstered seats, premium materials and soft surfaces fill the interior of the E-Type to provide a clean luxurious drive room setting. 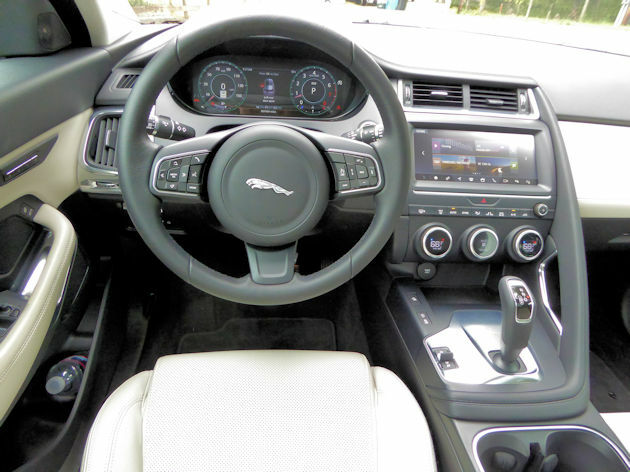 The controls have the quality feel and look we expect from all Jaguar vehicles. Two small features we found missing, however, were the important passenger assist handle over the door and an adjustable sunshade extension to help move the shade to block the glaring sun from the side windows. The 10-inch screen that controls audio, communications, navigations and climate systems is mounted on the center stack about the same level as the steering column. The large graphics make it easy to use, but it?s more complex than some we?ve used and will require a bit more learning time for a new owner. The instrument panel is a 12.3-inch screen and yet another screen mounted on the top of dash reflects into the windshield for the Head-Up Display. Another switch allows the driver to tune the driving style personalizing throttle, steering and transmission settings. 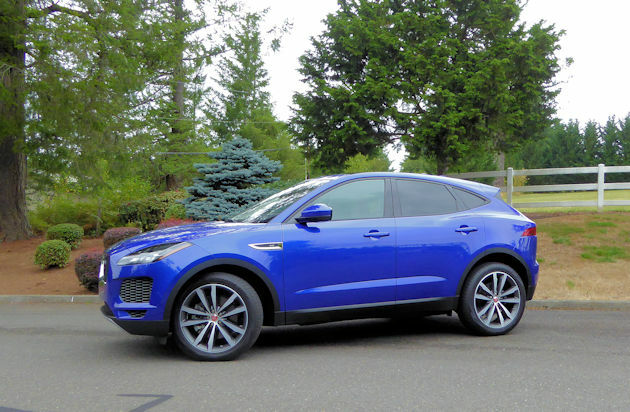 Rather than the powerful V6 engines and one diesel options offered in the larger F-Pace, the E-pace gets a pair of available Ingenium 2.0-liter turbocharged four-cylinder gasoline engines producing 246-hp and 296-hp. Both engines are attached to 9-speed ZF automatic transmissions. We didn?t think the transmission was as smooth and positive as the 8-speed ZF offered on other Jaguar models. The transmission is controlled by the large dial mounted on the center console and the shift paddles mounted behind the steering wheel. Numerically, the E-Pace smaller E-Pace engine has a 0 to 60 mph acceleration run in a brisk 6.6 seconds (the 296-hp version takes 5.9 seconds) according to Jaguar data, and the top speeds are 143 and 151 mph respectively. The EPA rates fuel economy at 21 mpg city, 28 mpg highway and 24 mpg combined for the smaller engine and just slightly less for the larger engine. We averaged 23.9 mpg during a week of mixed highway and city driving the 246-hp version. A permanent All-Wheel Drive (AWD) system propels the E-Pace directing power seamlessly to the wheels with the best traction. In normal conditions, the system intelligently distributes torque between the front and rear to maximize stability and handling. On slippery surfaces the system can send almost all the engine?s power to the front or the rear if either axle loses traction. An Active Driveline system on the 296-hp defaults to front-wheel drive when cruising but when conditions call for it, it instantly (within 300 milliseconds) sends all the torque to the front or rear axles. Cornering, the Active Driveline analyzes yaw rate, throttle position, steering angle and lateral acceleration to pre-emptively distribute more torque to the outside wheels. This creates a more neutral and predictable base handling balance. E-Pace also has a brake-based Torque Vectoring to help the driver maintain control. Riding on a MacPherson struts in the front and integral multi-link rear suspension with coil springs the E-Pace handles well under normal driving conditions and feels well-balanced running up a mountain road. The E-Type looks trim but weighs about 4,200 pounds, making it one of the heavier of the compact luxury SUVs. While the extra weight adds to the solid, planted feel, it takes a bit away from the efficiency and performance. 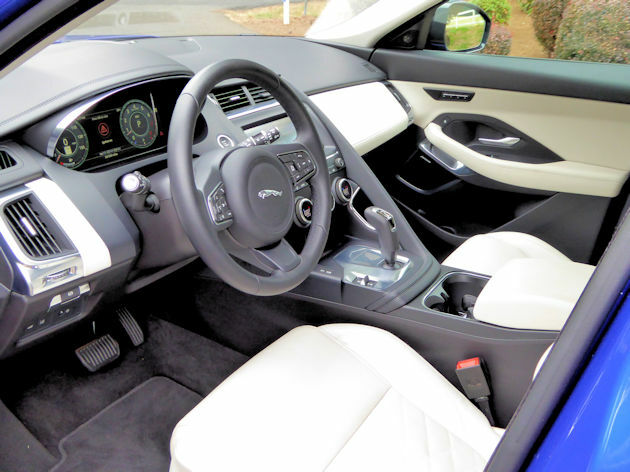 The Jaguar E-Pace is equipped with all the latest driver assistance features like Blind Spot Assist, Forward Traffic Monitor, Park Assist, Emergency Braking, Roll Stability Control, and many others. 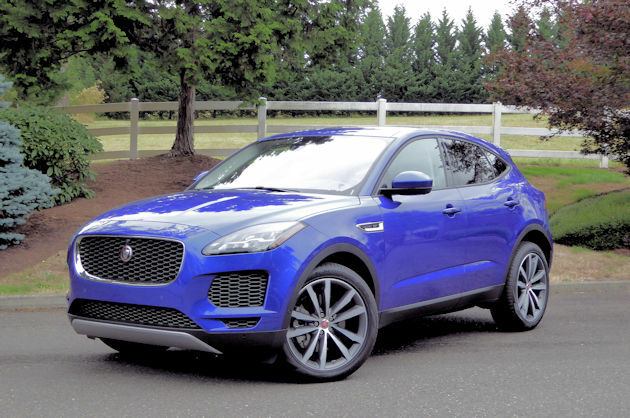 There are two Jaguar E-Pace models, the E-Pace and the E-Pace R-Dynamic. Each model has three available trim levels. Prices range from $39,595, including the destination charge, for E-Pace up to $53,845 for the E-Pace R-Dynamic HSE. Checking all the option boxes can run the price just north of $66,000. 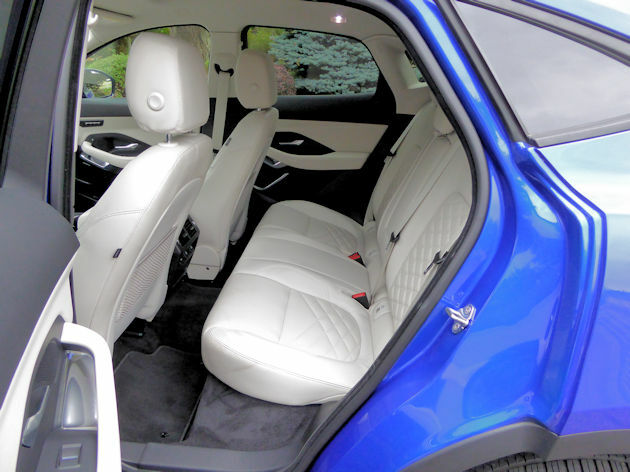 This is a stylish, fun-to-drive, compact luxury SUV that will turn heads as it passes.